The Scouting Alumni Association has changed its name to Scouting Alumni & Friends, a reminder that the group is open to anyone who wants to help further Scouting’s mission — even those who were never in Scouting as young people. The Scouting Alumni & Friends name and logo are being officially unveiled at the BSA’s annual meeting next week in Florida, but Bryan on Scouting readers get a sneak peek today. Here’s the logo. Below it, I’ve explained how different parts of the logo represent the mission of Scouting Alumni & Friends. 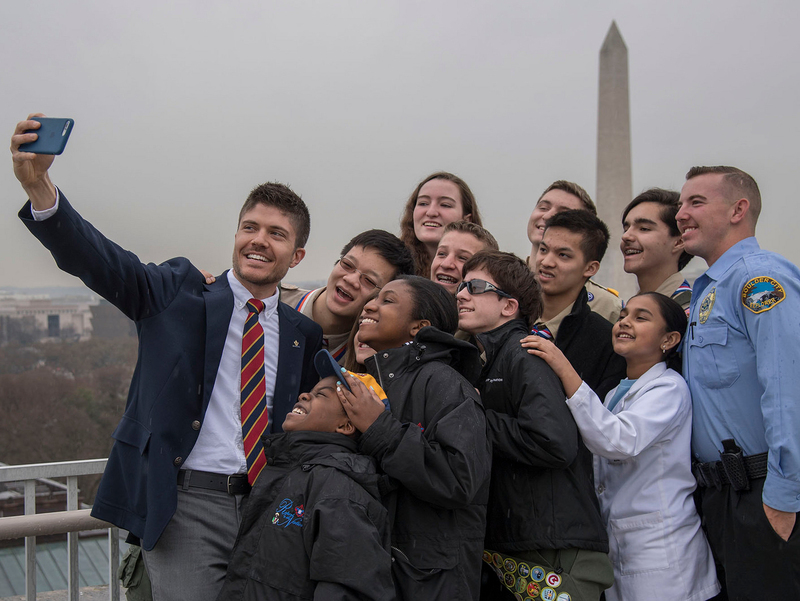 The acorn: An established icon of the Scouting Alumni & Friends awards program (like the National Alumnus of the Year award), the acorn suggests a seed from which much can grow. It is a call to alumni and friends to spread the word about Scouting. The letter A: This stands for alumni, and it’s meant to look like a varsity letter. As a Scouting alumni or friend, you’re part of a team, too. True Blue: The color of the central image is rendered in “True Blue,” which signifies the loyalty of Scouting Alumni & Friends toward the Boy Scouts of America. What does Scouting Alumni & Friends do? Scouting Alumni & Friends is Scouting’s alumni network, and it helps individuals reconnect with Scouting and the specific Scouting organizations that are important to them. The group provides a way for Scouting alumni to reconnect with their Boy Scout troop, Sea Scout ship, Explorer post, Venturing crew, summer camp staff, Wood Badge troop, Alpha Phi Omega chapter, Order of the Arrow lodge and more. It also helps Scouting friends connect to the program in new and interesting ways. Scouting Alumni & Friends provides best practices for alumni groups, powerful tools like its alumni database, and training courses at the council level and the Philmont Training Center. Scouting Alumni & Friends also offers awards programs such as the Alumni Award and knot, special recognitions for years of service, and the Regional Alumnus of the Year and National Alumnus of the Year awards. There’s only one requirement: You have to be a fan of Scouting. Anyone who has been positively impacted by Scouting is welcome to join. In addition to supporting local Scouting, members get a number of alumni-only discounts, perks and services. Hiker (free): Includes a quarterly e-magazine, a bi-monthly newsletter and some BSA ringtones. Pathfinder ($35 a year): Includes Hiker perks, plus a Scouting magazine subscription, an affiliation card, a lapel pin, a luggage tag, a window cling, discounts at major retailers and more. Learn more and join today at the Scouting Alumni & Friends site. You can follow Scouting Alumni & Friends on their social media channels to keep up with the latest news: Facebook, Twitter and Instagram. In the coming weeks, Scouting Alumni & Friends will be asked to “post your colors” to share your enthusiasm for Scouting. Stay tuned. Thanks to James Delorey, vice chairman of Scouting Alumni & Friends, for the info.